Prior to the arrival of Europeans, bands of Indians roved the area. Significant change occurred in the eighteenth and nineteenth centuries when European settlers cleared more than half of the Kettle Moraine for farming. In 1937, the state legislature created the Kettle Moraine State Forest. This legislation sought to counterbalance the urban population growth and provide space for recreation. Lawmakers created two large partitions, a northern unit (30,000 acres) in Washington, Fond du Lac, and Sheboygan counties, and a southern unit (22,000 acres) that covered parts of Waukesha, Walworth, and Jefferson counties. Both units offer snowmobiling, along with silent sports such as skiing, hiking, biking, and snowshoeing. The southern unit also features the Scuppernong River Habitat Area, the largest wet prairie east of the Mississippi and the popular Paradise Springs. Visitors to the latter witness water flowing from the spring (once owned by a salt baron, among other former, private owners) at a rate of five-hundred gallons per minute. Three smaller units round out the park system. 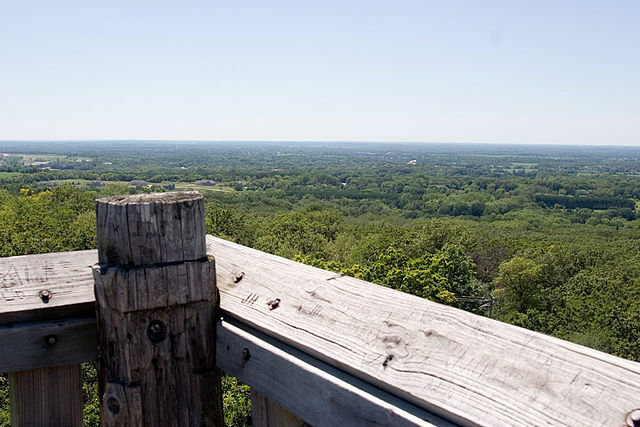 Lapham Peak, near Delafield, features a lighted ski trail, while Pike and Loew lakes offer camping facilities and canoeing. All five units are linked by two trails: the 115-mile Kettle Moraine Scenic Drive for cars and, for hikers, the Ice Age National Scenic Trail. The parks have proven popular with Wisconsinites and out-of-state visitors. In the late 1960s, more than half a million people visited the northern unit annually while over 300,000 visited the southern sections each year. By 2013, the number of annual visitors had ballooned to over two million. Visitors have also come to the state forest in search of the supernatural. Since 1991, UFO seekers have met at Benson’s Hide-A-Way, a UFO-themed bar and restaurant in Dundee. The annual July gathering, known as “UFO Daze,” provides a forum for UFO enthusiasts to exchange stories. Bill Benson and others report sightings of glowing spaceships, flying spheres, and illuminated objects in the sky. Dating to at least the 1980s, Benson and others have claimed Dundee Mountain, which is really a kame, is the best spot to see a flying saucer. ^ Chapter 4, Northern Kettle Interlobate Moraine, NPS Scientific Monograph No. 2, National Park Service website, http://www.cr.nps.gov/history/online_books/science/2/chap4.htm, last accessed June 2015, now available at https://www.nps.gov/parkhistory/online_books/science/2/chap4.htm, last accessed September 3, 2017. ^ “Land of Kettles and Kames”; “Ice Age Trail Glossary,” Ice Age Trail Alliance website, accessed July 28, 2015. “Drumlin” derives from the Irish “druim,” meaning narrow ridge; “kame” derives from the Scotch word “comb,” meaning steep hill, and “esker” comes from the Gaelic “eiscer,” meaning ridge. ^ “Crisis in Kettle Moraine”; “Kettle Moraine State Forest—Northern Unit, Geological History,” October 17, 2014, accessed June 10, 2015. ^ “Kettle Moraine State Forest—Southern Unit Paradise Springs Self-Guiding Nature Trail,” Wisconsin Department of Natural Resources Bureau of Parks and Recreation website, accessed June 17, 2015. ^ “The Kettle Moraine State Forest Has the Cure for Cabin Fever”; “Ice Age Scenic Trail,” Wisconsin Department of Natural Resources website, accessed June 12, 2015. ^ Robert Ireland, “What Were They Thinking,” Fond Du Lac Reporter, June 21, 2005, accessed, June 10, 2015; For primary accounts, see UFO Wisconsin website, last accessed September 3, 2017. ^ Harold Henderson, “UFO Daze,” Chicago Reader, June 2, 2005, accessed June 10, 2015; Betsy Thatcher, “Long Lake Area Spawns Tales of UFO Sightings,” The Milwaukee Sentinel, September 5, 1989, accessed, March 26, 2015, https://news.google.com/newspapers?nid=1368&dat=19890905&id=FopQAAAAIBAJ&sjid=7hIEAAAAIBAJ&pg=6894,1169972&hl=en; Ireland, “What Were They Thinking”; “UFO Daze 2012 Dundee Wisconsin SkinwalkerRanch.org Local Expedition,” Youtube, August 2, 2012, accessed June 3, 2015. ^ Thatcher, “Long Lake Area Spawns Tales of UFO Sightings;” Ireland, “What Were They Thinking”; Thread/Topic: Dundee Space stations, UFO Wisconsin website forums, 2005. ^ Thatcher, “Long Lake Area Spawns Tales of UFO Sightings”; Charlie Hintz, “Benson’s Hide-A-Way,” Wisconsin Sickness website, May 6, 2010, accessed June 1, 2015.